Are you having problems with rats and mouse in your house? Did you know that there are baits today that can help you get rid of this infestation? If you are one of the many who is having this kind of infestation in their house, then knowing the best rat and mouse bait available in the market today is essential. Rats and mouse can be everywhere, and they can live with you in your house. This can be a big problem especially if they start damaging your clothes, eating your food, and starts creating a mess. But how will you know if you already have a rat and mouse infestation? Let’s find out by reading the information below. Two of the most common signs that there are a rat and mouse infestation is the appearance of droppings of about 50 to 80 per night, which are dark and small. These droppings are randomly scattered around the house, and they can be seen at the top of the cupboards and inside as well. The urine pillars are usually made out of a rat or a mouse’s urine and dirt, which can build into tiny mounds. Another sign that you have an infestation is the weird noses that you usually hear at night. You can hear scratch sounds between lofts, basements, ceilings, under floorboards, and partition walls. They are mostly active at night, which is why you can certainly hear them during this time. Check your cupboards, under the stoves, fridges, floorboards, cavity walls, and ceilings for materials that can easily be shredded, since these are used by rats and mouse for nesting. If you notice grease marks which are usually dark smears and are often seen in corners and holes, then the rat and the mouse are the ones who are causing those marks. The marks are created when their bodies start to brush the floors and walls of your house again. If you have lofts that are unused or dust basements, then you will probably see little footprints that belong to the rats and mouse that are infesting your home. If your house is sparkling clean, then sprinkling your floor with some talcum powder and flour and check them the next day of there are tracks that are fresh. Since rats and mouse frequently urinate, the smell of an ammonia-like scent is strong. Always put in mind that the stronger the smell, the nearer you are to where the activity is happening. Of course, if dead rats and mouse are seen, then this can also be a sign of infestation. Now if one or more of these signs are present, then it is a clear sign that you already have a rat and mouse infestation. This is also the right time for you to purchase a rat and mouse bait, for you to be able to eliminate them. But you may be wondering why a rat and mouse bait and not the other types of tools to remove these pests. Let's find out why below. 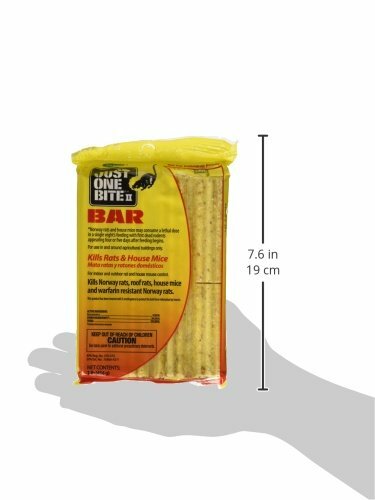 These are the best rat and mouse bait that is available in the market that you can choose from. But of course, in every review there will always be a winner and the winner in this review is the MOTOMCO Tomcat Mouse and Rat Bromethalin Bait Chunx. The reason behind this is because of the effectiveness that it has in killing rats and mouse. It can also be used outdoors and indoors, and no matter what the weather is. One of the reasons why using a bait is better because it can be utilized for an extended period of time. All you have to do is to ensure that it is free from dust and moisture. Avoid exposing them to the environment that is external to make sure that the bait's toxicity will be reduced. Rat and mouse baits are easier to use because you can just place them wherever you want. You can even put them in an area that's hard to reach. It is also easier to move the bait from one place to another without even touching it. You can also throw the rat or mouse trapped in it without worrying of touching it and contaminating yourself. Lastly, you can easily see if there is a rat or a mouse that is caught so you can get rid of it immediately before it starts to smell. Place some baits in the cavity walls, such as airing cupboards, under the stairs, crawl spaces, and ceilings. Some people think that these locations are safe from rats and mouse, but they are not, and putting baits there will help you catch every pest that will go there. Besides spiders, you will probably see rats and mouse running around your basement. This can be a problem because they are damaged vents, air bricks and some of the things that you have in your basement. So placing some baits in there will surely be beneficial. It would also be best to check laundries and kitchens since rats and mouse have the tendency to squeeze themselves at the base of the cooker or under the freezer. They can also sneak into cabling and pipework and behind your washing machines as well. Of course, for you to be able to protect your home from these infestations, it would be ideal to know the best rat and mouse bait available on the market. In this way, you will know what bait is perfect for your home. 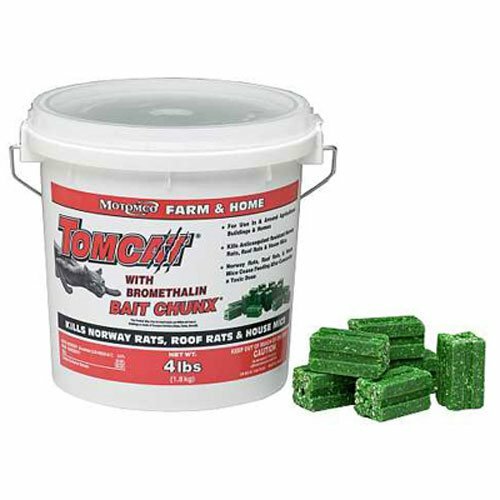 MOTOMCO Tomcat Mouse and Rat Bromethalin Bait Chunx can be used in homes and farms. The good thing about this product is that it can attract all types of rats no matter where they are hiding. This means that the probability of rats and mouse eating this poison is actually high. People love using this product because it can instantly kill the rodents, which means that you no longer have to look for them when they start to smell. The MOTOMCO Tomcat Mouse and Rat Bromethalin Bait Chunx contains bromethalin which is known as a point toxicant. Another good thing about this rats and mouse that are resistant to anticoagulant can be killed by this bait. Lastly, it can quickly kill rats after just one feeding, which means that it can help you to control the rodents easily. Just One Bite II Chunks contains bromadiolone which is known as the active ingredient. It also gasses an anticoagulant, a second-generation agent which can cause for the rats and mouse’s internal parts to start bleeding. The center hole mounting is used for the bait stations if needed. The edges that it has can easily be nibbled to promote the chewing of rat and mouse. In fact, a single night’s feeding can already be a lethal dose for rats and mouse. 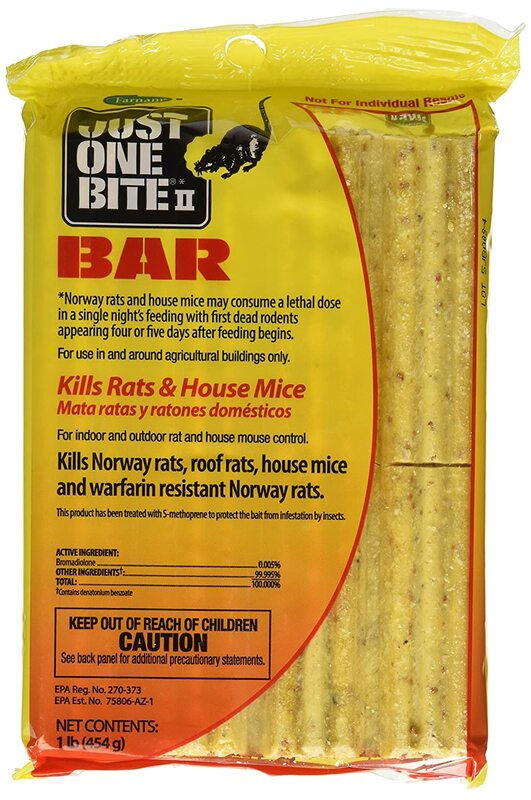 The Just One Bite II Chunks can kill Norway rats that are warfarin resistant. The formula that these bait chunks have are palatable with seeds and grains. The product is sold in 8 lbs. pails with 64 chunks. It is also available in 12 lbs. of pails with 96 chunks. So it would be better to choose the bigger one to ensure that you can kill as many rats and mouse as possible. 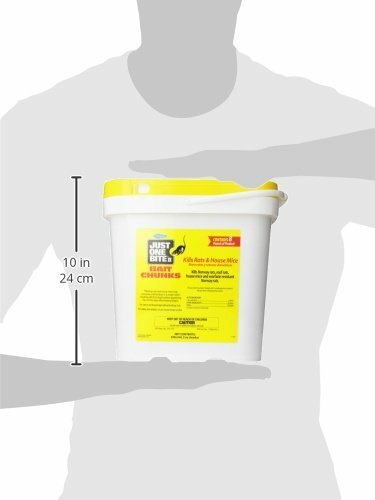 When using this product, make sure to wear gloves when placing the baits to specific areas in your house and as well as when collecting the remains of the pests. This means that this backpack spray can easily be used with less effort. Old Cobblers Farnam Just one Bite has the power to kill house mouse, roof rats, and as well as Norway rats, inside and outside of the house. The product contains .005% of bromadiolone. These rats and mouse bait can only be used in and out of any buildings that are considered at agricultural. The good about this bait is that it can provide a lethal dose in just one feeding, wherein you can start seeing rodents that are dead in as little as 5 days. The Old Cobblers Farnam Just one Bite should never be placed in locations where there is a high possibility of food contamination or any surfaces where it can come in contact with your food. Another good thing about this bait is that it can easily be broken down into pieces, which means that you can use as much as you can to kill as many rodents as possible. The bait also features a hole in the middle to allow the mountain in a bait station. When placing the Old Cobblers Farnam Just one Bite, it would be best to place them 15 to 30 feet apart from each other. 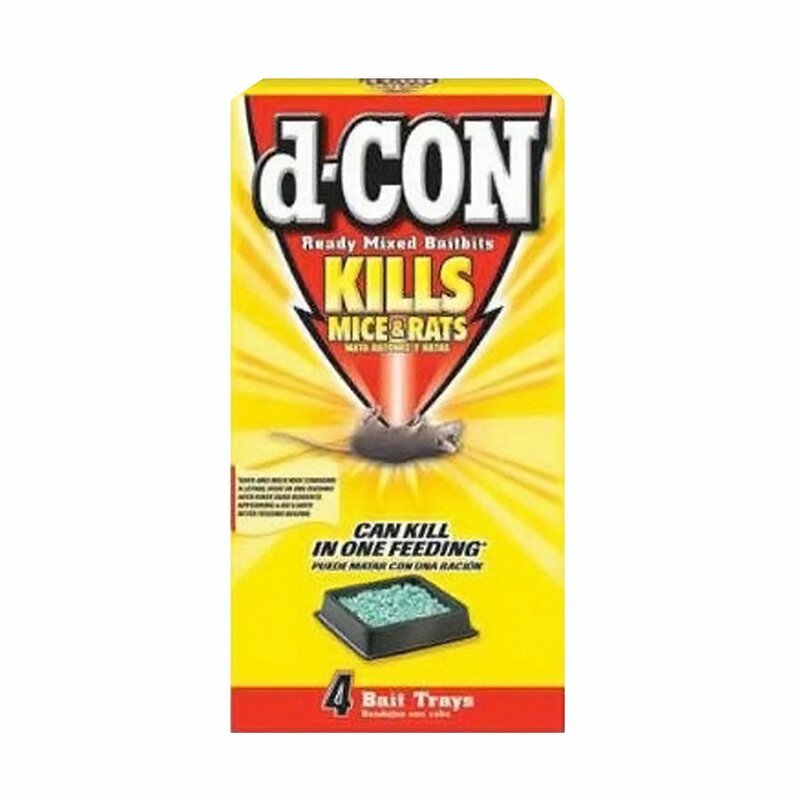 D-Con Mouse Proof II 4 Pack has a unique form wedge shape which can attract most rats and mouse. This poison can lessen the scruffiness once you start placing them. It also fits well in every area, no matter how hard it is to reach it. The bait contains a poison that is unique, which is made to kill all the rats that are resistant to warfarin. Warfarin develops to rats’ immunity after a few generations. 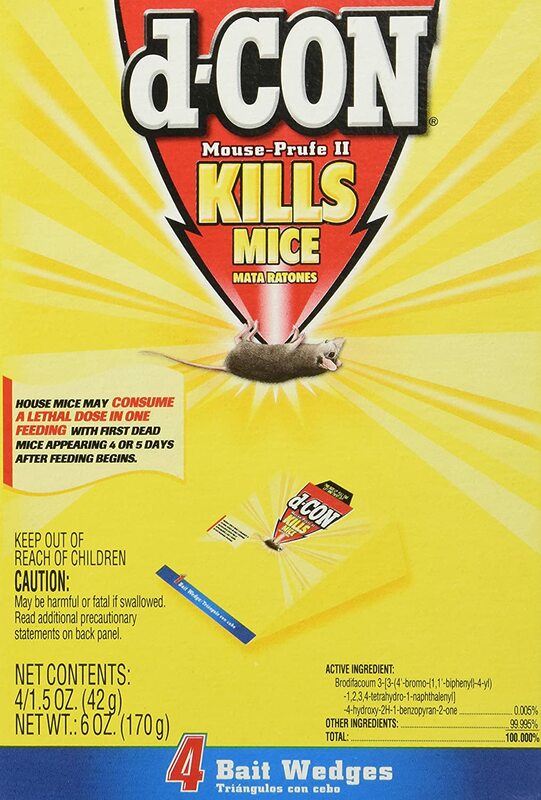 The D-Con Mouse Proof II 4 Pack can kill most rats in the house in just a short period after consuming the poison. The bait contains a brodifacoum formula that can kill even the most resistant rats and mouse in the house. It also contains an anticoagulant, which produces a prothrombin extensive, that last for a maximum of 30 days after they get exposed. When the rats and mouse get poisoned, the vitamin K1 and intramuscular are shown when overdosed. 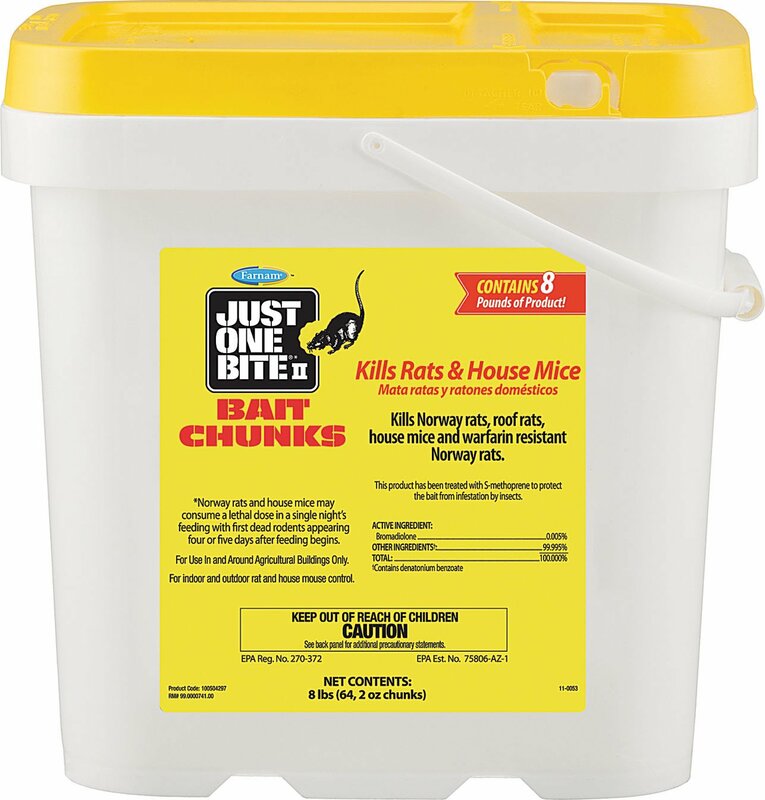 D-Con Ready Mix Bait Bits for Mice is one of the most effective rodent control in the market. This product is good because you don’t have to contact with the rats or mouse. The reason behind this is because once they eat the bait, they will leave the area and die somewhere else. They will usually be going outside since they will be seeking for water. If the directions are followed properly, the product is proven to be efficient and safe. 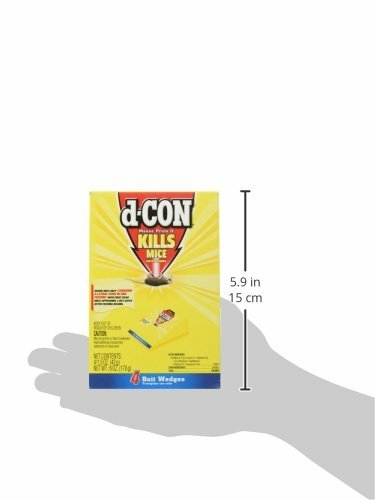 The D-Con Ready Mix Bait Bits for Mice can kill rats and mouse after just one feeding. You can already see rodents that are dead after feeding for 5 whole days. This product contains Brodifacoum which will help kill rats and mouse that are resistant to warfarin. This means that you no longer have to worry about anything at all. Start eliminating rodents in your house by choosing the best rats and mouse bait available today.